Bruce will be promoting their self-contained Wash Plant – Bruce WashPod. Our constant focus on product development and innovation has further enhanced this machine’s capabilities. Aggregate scrubbing, trash removal, aggregate rinsing/sizing and sand dewatering are all included in one neat package. Minimal footprint (size of a 40ft Container), manoeuvrability, use of branded components throughout and production of quality in-spec end products are just some of the key benefits offered to customers. As well as the Bruce WashPod, visitors will be able to view the BWB120 – Bruce Water Separator. 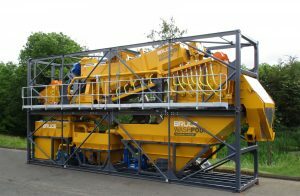 Now with the added benefit of a new optional silt removal system, the BWB120 is designed for the removal of lighter density materials such as plastic, paper, cardboard, wood and polystyrene from aggregates, rubble, Trommel fines plus C & D waste. The Bruce Water Separator is an effective cost-efficient machine enabling customers to clean material and create additional revenue streams from previously redundant materials. Bruce sales and engineering staff will be on hand to answer questions and discuss your requirements for washing/screening/feeding/ recycling solutions and we look forward to welcoming you.